Tokai Forum - a subsidiary of TokaiRegistry.com :: View topic - Show me your pedal boards! 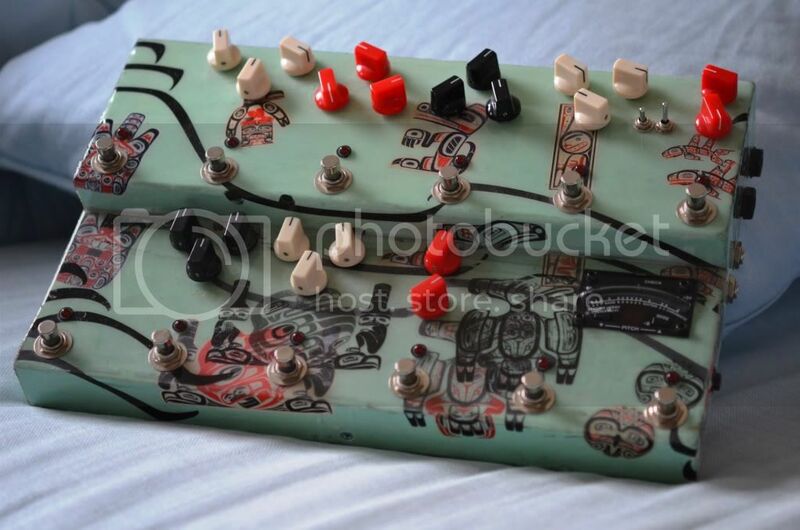 A couple of years ago I went pedal crazy, then I went DIY pedal crazy, and finally pedal modding crazy. It lasted about 2 years and I've finally grown out of the unending quest for 'tone'! The board is home-made, and deliberately laid out so that I can't keep adding to it. Self-control! Can you run through what they all are? Are some home-made? And is the top level on its own loop? Three on the lower layer are home-made BYOC kits, each modded to my own specs. The way I have it laid out is that the bottom layer are all in the main line, and the top layer is the amp's FX loop and reverb footswitch. We have a Crybaby 535Q Copper wah (modded by Stuart Castledine), a BYOC fuzz face, a modded Big Muff, a BYOC Rangemaster and a BYOC Tubescreamer. On top there's a MonkeyFX true bypass loop containing a DM3 analogue delay, modded CE2 chorus, and a Yamaha FL10 Flanger. I refuse to have any more pedals or do any more modding, for the sake of my own sanity! Nice.. I've made a couple of BYOC kits - a tremelo and a compressor and still use the trem a lot (the compressor needs some joints checking I think as it's gone a little inconsistent). It's not that bad. One vintage fuzz, one modern high gain fuzz, one overdrive and one vintage boost! All the dirt bases covered. More pedals than a Quint! I've gone pedal mental again! This time I obsessed about the tunes we have where I need a univibe and reverb one minute, and a dry but distorted sound the next. Or chorus and clean to crunch and delay and back again. Too much turning off of stuff and turning other things on in very little time, so I decided to justify to myself a Carl Martin Octaswitch. It's an eight input, eight channel pedal loop system. 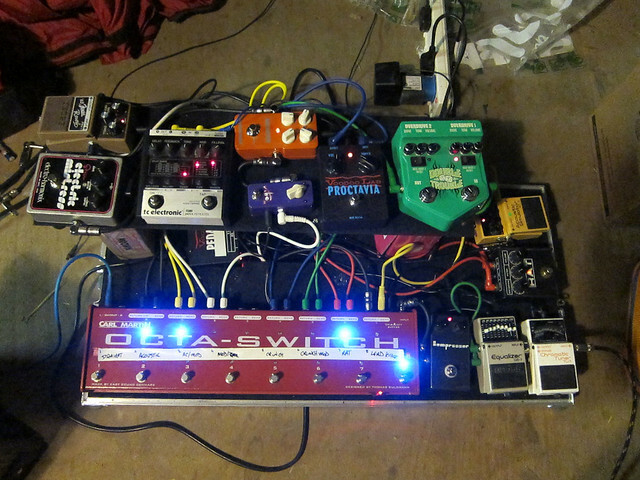 So the pedals are all on and all feed into the Octaswitch. Then each of the eight channels has an eight-switch dipswitch, so you can tell it which effects you want on when you hit that switch. It's not an on/off system, as one channel is always on, so I have one set to clean. 3. AC2 with Modulation (I have all three modulation pedals on one patch as it's rare that I'll want them all on at once - so there's a choice of TC Vibrato, EHX Electric Mistress (set for Flange) and the Love Pedal Pickle Vibe. And now I reckon I want a TC Electronic G System! 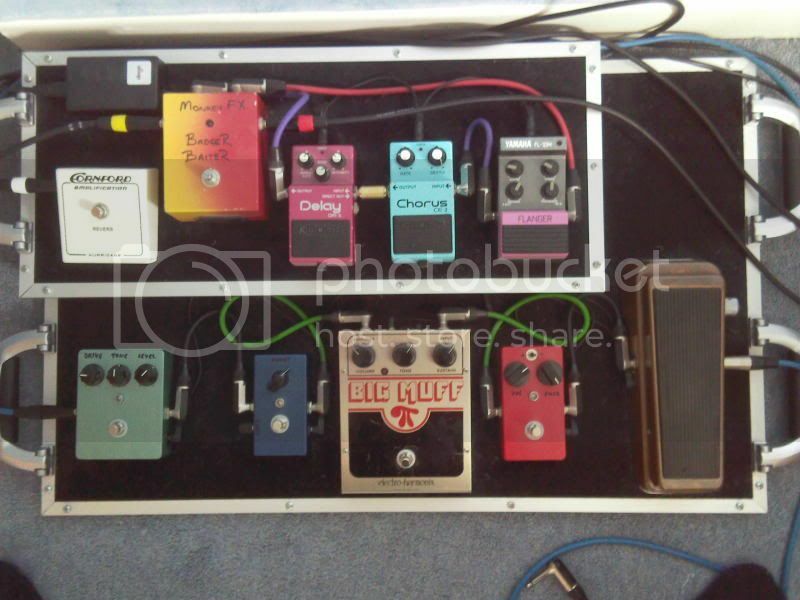 I also am going to build a second pedalboard, with all my spare pedals, to be my blues board. Just an overdrive, delay, boost and reverb perhaps. I see a lot of nice pedals here! I've had 160ish pedals until last year when I decided to get a custom multipedal made by JAMpedals of Greece. And I still love it! I've seen this in another thread, haven't I? Can you go through what all the bits do for us? Yeah I think I posted it before somewhere.. This is not the internal order of pedals btw. There's a switch to get the tuner out of the circuit and a send-return placed after the distorsion to add some more pedals when needed. All JAM pedals are true bypass and analog, love 'em! !